We make a tremendous effort of incorporating your ideas and suggestions into IndustrySafe. To address your needs and concerns, we constantly make updates to the software. Please provide us with feedback on this release or provide suggestions for new releases here: https://www.industrysafe.com/newcase.htm. If you have any questions or concerns regarding the update, please contact us at support@industrysafe.com. A more detailed PowerPoint presentation on the release is available here. We will be offering free live webinars covering the new features in the 5.14 update. IndustrySafe's report scheduler allows administrators to schedule reports to be run and emailed out on a regular basis. With the 5.14 update, system administrators can now set scheduled reports to be emailed out in an Excel file format. The report scheduler tool is available within all of IndustrySafe’s log reports. For more information on building scheduled reports, please review this guide. To help users better manage the calibration of assets, the "Calibration Due Date" field has been added to the Asset Summary Screen. Two new email alerts, "Calibration Coming Due" and "Calibration Overdue" Alerts, are also included in this release so that users can be notified of upcoming and past due asset calibrations. As a reminder, system administrators can configure these email alerts using IndustrySafe's Email Template Editor. 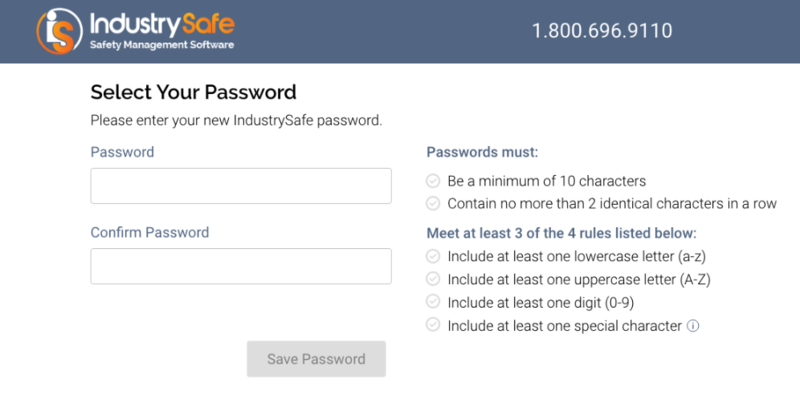 As part of our efforts to align ourselves with industry standards for password security, the 5.14 update will also implement improved password security processes that will impact IndustrySafe's new user setup and password reset procedures. To reset your password, click the "Forgot Password" link on the login page and enter in your email address when prompted. You will then receive an email containing a link that will take you to IndustrySafe's redesigned Reset Password Page. There you'll be prompted to choose a new password that meets IndustrySafe's enhanced complexity requirements. After successfully resetting your password, you'll then receive an email confirmation that your password has been changed and you will be able to log in with your new credentials. As part of the 5.14 update, password fields have been removed from the user profile form and a "Reset Password" button has been added. This button will appear after a user profile form is saved for the first time. If an email address has been recorded for a user, clicking the "Password Reset" button will send an email to the user that will allow them to reset their password. System administrators should be aware that the "Email Address" field will now be set as a required field on the user form by default. However, administrators can set the field to be optional using the Form Editor. When a user profile form is saved for the first time and an email address has been entered for the user, the new user will automatically be sent an email containing a link that will allow them to set up their password. The 5.14 update includes a new registration process for training content learners who do not have a company email address. If an email address is not entered for a user and the "Training Content Learner" user property is checked off on the user profile form, a link to IndustrySafe's Self-Registration page will appear on the form after has been saved. System administrators can provide the learner with the link to IndustrySafe's Self-Registration page and their username or employee ID so that they can complete the user registration. When learners navigate to the Self-Registration page, they will enter their username or employee ID, and then will be prompted to enter their email address. Upon successful validation of the email address, the learner will be sent an email that will allow them to set up their password. After a Corrective Action form is saved once, the "Date Identified" field will become locked. To edit this field, users must be assigned to a user level with the "Modify Corrective Action Assignment" user permission. Within Corrective Action forms, if a user has entered an Actual Completion Date that is before the Estimated Start Date, when the user attempts to save the form, their actual completion date will be cleared out and an error message will now appear at the top of the recording form. Clicking on this error message will take the user directly to the Actual Completion Date field. The "Severity," "Probability," and "Risk Assessment" fields are now available within the Corrective Actions log. 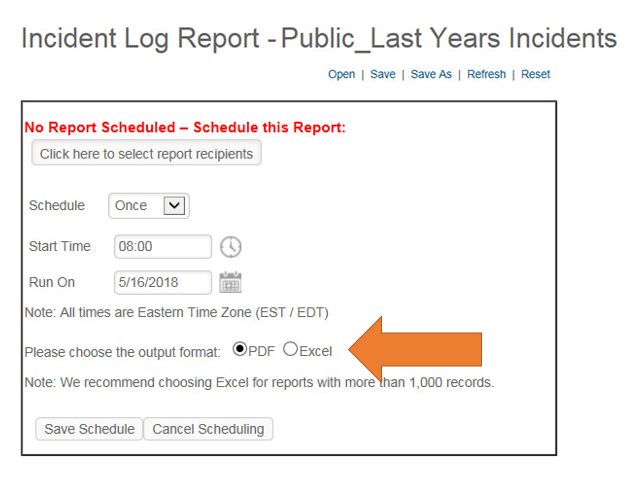 Incident Print Out Reports generate successfully now upon clicking the "Create Report" button. When the year is changed within a monthly stats form and the form is saved, the hours entered for each month will now display under the appropriate year within the Monthly Stats Summary Screen. The advanced search for the Initial Incident Form no longer breaks when you search for closed incidents. Several other advanced search errors have also been corrected. Links contained in Task email alerts now take the user directly into the task, instead of to the Home module. Broken links contained in email notifications have been repaired for certain customers using IndustrySafe's Single Sign On (SSO) service. The "Export to PDF" link within the Dashboard has been fixed. Previously, clicking this link would result in an error message. The "Motor Vehicle Incident Rate per 1 Million Miles Driven" Dashboard chart has been repaired. If you change the label of the Basic Information section heading on any form, the new label now displays on the form. Several Public Web Form configuration issues have been fixed. Fighting Fatigue in the Workplace - NEW! Hot Work Safety and the Permitting Process (Spanish Language) - NEW!